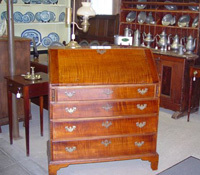 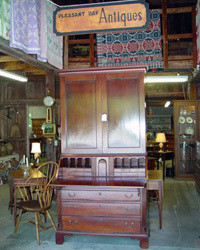 As you enter the large barn, you are greeted by an 18th century Connecticut cherry secretary-desk, descended from an old Chatham family. 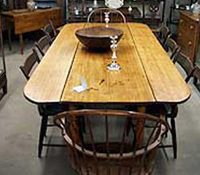 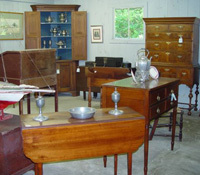 The barn has four large rooms filled with similar 18th and early 19th century American furniture. 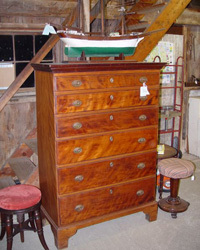 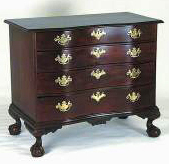 A tiger maple desk, a cherry tall chest and many cupboards, beds, tables and chairs are always in inventory. 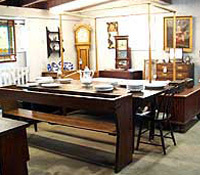 There are a number of paintings hanging on the walls by local Cape Cod artists from the late 19th and early 20th centuries, many of which depict local scenes and water views from that era. 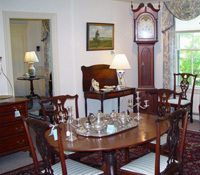 A number of period American tall case, shelf and wall clocks will impress any clock collector.